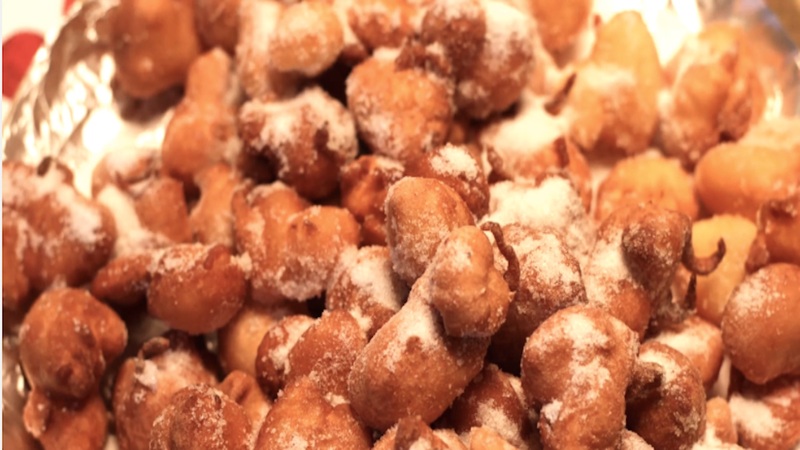 A World Of Sweets: Episode #5: Carnival Fritters (Italy) – Feat. Nonna Fernanda from BreadLoveAndDreams on Vimeo. In a big bowl sift together flour and baking powder. Add sugar then one egg, one egg yolk, vanilla extract, grated lemon peel and grated orange peel. Add the Cognac, the milk and stir well. The consistency of the batter should be not too firm and not too loosely. Cover the bowl with a lid pan or cling wrap and let rise for about 1 hour. In a large skillet heat abundant oil with a couple of tablespoon of lard (or shortening). Allow the oil mixture to reach the right temperature for deep-frying. Let the fritters float into the oil until turn upside down and golden brown. Drain the fritters with a slotted spoon and place them on a plate covered with paper towel. Serve hot, sprinkled with granulated sugar.